Every year, this day always has me in conflicted feelings. On one side of the spectrum I celebrate the birth of my Father, and on the other, I remember a life of a beautiful, talented, young woman who's life was cut so short. I always find that the weather describes my mood best. And ironically all day, it has been raining tears from the heavens above. Words alone cannot fathom the amount of love and inspiration Aaliyah has had on me, but for those who know me well, already know that I've been down for her during the good old Timbaland days of the 90's. I still remember that very day of hearing the news of her passing. I refused to believe it. I couldn't believe it. My idol, the one who I looked up to the most no longer here? I was at home, saw the news on the tv, and felt my heart feel heavy and down. I turned away and looked outside the window, gazing at my back garden. I then looked up towards the clouds, contemplating in deep thought, and broke down in an ocean of tears. That day I will never forget, but I do know that although you are not here physically, you are with us in spirit Babygirl. To this day, I still see your influence in music, fashion etc... So I thank you for blessing us for those 22 years of your life. My thoughts and prayers shall remain with your friends, family and loved ones. Drawn by yours truly. 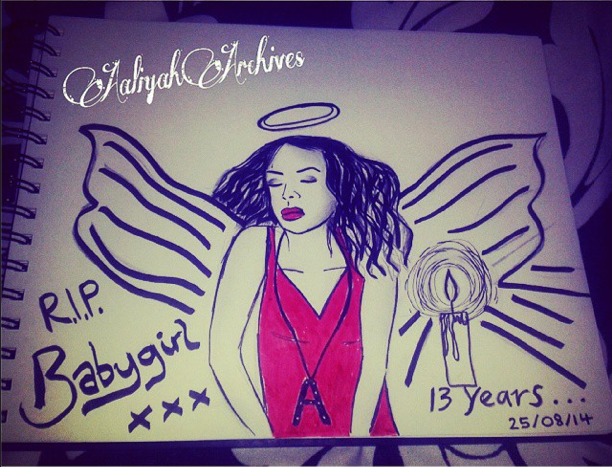 RIP Babygirl.